The sound of engines whistling seems to me to be an important part of the steam era. In and around the station area, engines whistle predominantly for two reasons - one whistle to warn that they are about to move, and two whistles to indicate to the signalman that they have shunted as far as they need and are waiting for points to be changed. 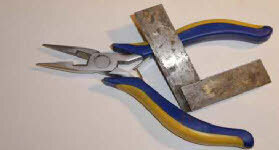 I’m unlikely ever to change to DCC, so is there an alternative solution? On Plumpton Green there are only four places where whistles are required - at the two platform ends, and at the north and south cross-overs, used for running round. An obvious solution seemed to be to fit speakers at certain locations, driven by some kind of sound system. I spent many hours searching the internet for a manufacturer of steam whistle sound systems, but failed to find anything - perhaps because with the advent of DCC nobody buys such things? I did toy with the idea of DCC, either with the thought of a full blown conversion of locos and layout, or the potential for using DCC sound modules in fixed positions. Neither appealed very much on account of cost and time. I eventually stumbled across the ‘Adafruit’ sound card sold by (amongst others) Digi-Key and Maplin in the UK. There are two versions, one with headphone outlet, and one with a 2x2W stereo amplifier. The headphone version would have required either an external amplifier plus speakers, or powered speakers. The version with the amplifier requires only speakers, so this is the version I chose. The photo (left) shows how small these sound cards are. 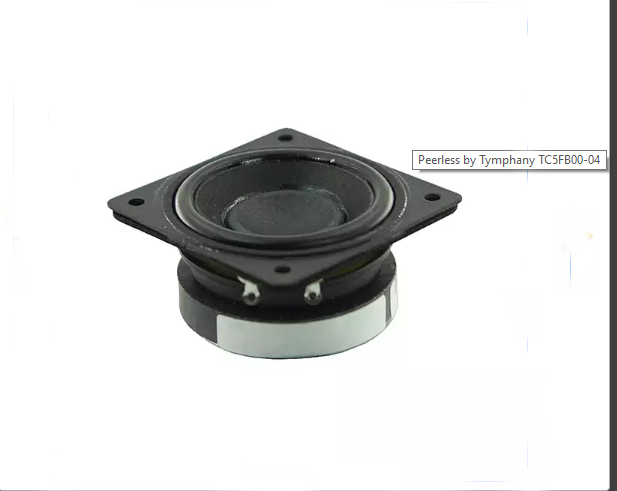 I picked out some miniature 4 ohm 5W ‘Peerless’ speakers by manufactured by Tymphany, and also sold by Digi-Key. 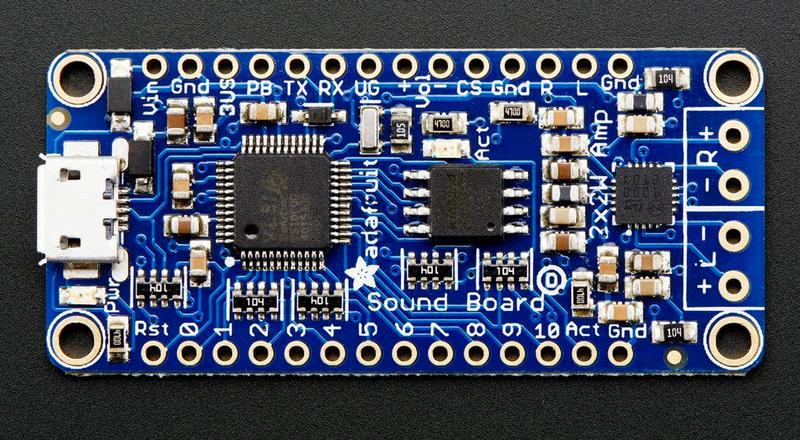 The Adafruit sound card can store and play several sound recordings, triggered by various switch types (press to play once; press and hold to play continuously; press to start/press to stop for example). The card can only play one recording at a time. To play a recording, one of the triggers (numbers 0-10 at the bottom of the photo, left) needs to be connected to Gnd (bottom right). The cards are sold with either a 2Mb SD card or 16Mb. The total length of recording depends on how the files are stored (either uncompressed .WAV, or compressed .OGG) and whether mono or stereo. The 2Mb version will only store a couple of minutes’ worth of compressed audio (OGG) so I opted for the 16Mb version, which easily handles 10 minutes of in OGG format. I have only two sound recordings on the card - a five-minute clip of countryside background sounds (birds/sheep/cows etc), and an engine whistle. 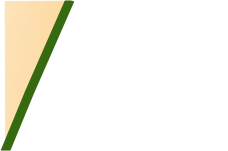 I have arranged the switching using a relay (diagram right). 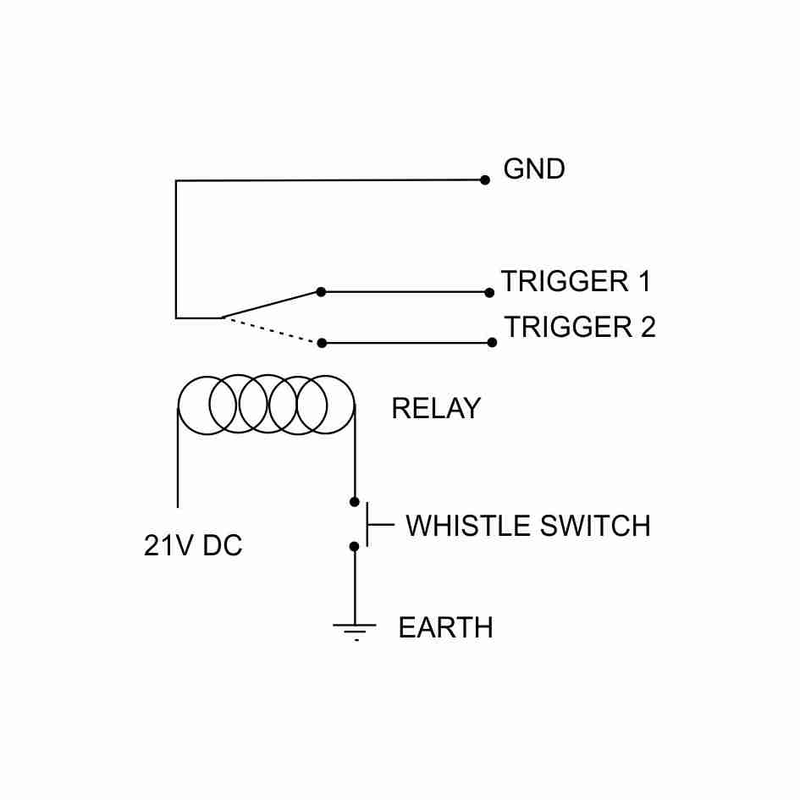 When not energised, a closed switch on the relay connects trigger 1 to Gnd, which plays the background sounds continuously in a loop. 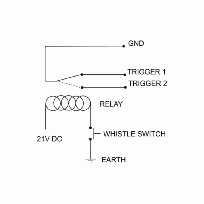 When the ‘whistle’ switch is pressed this energises the relay, which disconnects trigger 1 from Gnd and connects trigger 2 instead, thus playing the whistle recording. When this switch is released, the relay drops out, and reconnects trigger 1, starting the background sounds again. I created and mixed the audio recordings on my laptop, using Mixpad Editor software, and obtained most of the sound recordings I needed from various web sources. Once the recordings were complete, they were copied onto the SD card using the USB-microUSB connection. There are various ways of providing power to the sound card, either 3xAA batteries (4.5V) or a regulated power supply up to 5.5V. I concluded that the easiest option was to power them through the microUSB mains charger. The 2x2W built in amplifier is just about loud enough for the whistle to be audible at an exhibition, but the background sounds could be a little louder. If more volume is required the alternative would be to use the sound card with the headphone outlet, plus a larger amplifier, but this adds to cost, and the need to provide power to the amplifier.